Dr. Lawrence S. Feinsod, an educator and public school advocate for more than 40 years, was selected as the eighth Executive Director of the New Jersey School Boards Association in September 2012. The organization’s 26-member Board of Directors approved the appointment unanimously, following a nationwide search. As executive director, Dr. Feinsod manages the day-to-day operations of the organization, which is one of America’s largest school boards associations. NJSBA is a federation of the state’s 581 local boards of education and includes 81 charter schools as associate members. The state’s 5,000 local school board members, who serve without compensation, oversee the education of 1.4 million public school students. 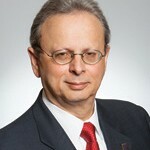 Dr. Feinsod has served as the superintendent of schools in the Cranford, Madison and Mount Arlington school districts. From 2008 to 2012, he was the state Department of Education’s executive county superintendent for Essex County, assisting and overseeing 23 school districts with a student population of approximately 130,000. He began his career as a special education teacher in Linden. In addition, he served for approximately 20 years as a member of the Board of Education of the Morris-Union Jointure Commission, including a term as the board’s president. Dr. Feinsod is a former president and co-founder of the Garden State Coalition of Schools, a grassroots advocacy group of school administrators, school board members and parents, established in 1992. He holds a Doctor of Education degree from Rutgers University, a professional diploma in Educational Leadership from Fordham University, and a B.A. and an M.A. from Kean University. He was named to Governor-Elect Phil Murphy’s transition committee on education, access and opportunity in November 2017. In October 2012, prior to taking the helm at NJSBA, he was presented “the key to Essex County” in a formal ceremony held by Joseph Di Vincenzo, the Essex County Executive. Senator Teresa Ruiz, chair of the senate education committee, assisted the county executive in recognizing Dr. Feinsod’s distinguished career. He is a recipient of the Outstanding Educator Award from the Newark affiliate of the National Organization of African American Administrators (2012), the Outstanding Service Award from the New Jersey Association of School Administrators (2008), and the Education Leadership Award from the New Jersey Coalition of Educational Leaders for the support and advancement of women in leadership positions (2004). Dr. Feinsod has been involved extensively in community and civic activities. He was a long-term member of the service organization Rotary International and was presented with the New Jersey State Vocational Service Award for his contributions to education from the president of Rotary International. Dr. Feinsod and his wife, Sharon, reside in West Orange. They have two adult daughters.